Here is the Matt Mitchell / Ches Smith Duo: piano and percussion in a banging set of patterns that rivet and hypnotize. Kids are taught that the piano is a percussion instrument, but who really buys that? Sure, the thing is full of 88 hammers that bang away at a web of strings, but how much piano music really emphasizes rhythm over melody and harmony? How many pianists would describe themselves as “percussionists”? Matt Mitchell might be one. Mitchell is everywhere in jazz right now -- everywhere that is creative and bold. He is holding the piano chair in the Dave Douglas Quintet, where he can blend tradition and innovation; he is playing with Tim Berne’s titanic Snakeoil group; and he is blending classical minimalism with jazz and who-knows-what-all in John Hollenbeck’s Large Ensemble and Claudia Quintet, to name just a few. 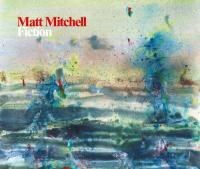 Fiction is the recorded debut of the duo Mitchell has with percussionist Ches Smith (his partner in Berne’s Snakeoil). It consists of 15 mostly miniatures in which the action is contrapuntal and highly percussive. Mitchell sets out melodies that are largely atonal and “free”, but where patterns recur and swirl in logical patterns, typically with his left and right hands in jabbing, throbbing rhythmic dialogue. Smith is a full partner, mostly playing a drum kit, mirroring the written lines, complimenting them, commenting or embellishing with a mind-meld level of intuition. This music is not particularly friendly, easy-to-digest jazz, just to be clear. But it’s fun stuff: a playground of rhythms and energy that never ceases to be inventive. There is a dancing quality to most of this music that is near irresistible: the opening track “Veins” moves at a punching eighth-note pulse that has the clattering momentum of a rolling stone. But it’s not dance music. It sounds more like the avant-garde free jazz that requires great attention to enjoy. The “melodies” don’t follow diatonic patterns, and the structures often sound improvised. It’s unclear to me how much of this music was composed before Mitchell and Smith sat down at their instruments; not “Brain Color”, where Smith and Mitchell both clearly know the pulsing theme by heart, but the one long track, “Action Field”, sounds spontaneous to me. But that makes little difference. The power in these performances comes from the thoughtful way in which the dialogue between Mitchell and Smith exhibits the drama and logic of percussive jazz improvising. These tunes are not examples of a single soloist being accompanied at a high level, though that is a wonderful model of how jazz can work. Rather, these are true duets. Mitchell seems like the dominant voice, as his instrument mostly supplies the sense of melody and harmony as well as the rhythm, but Smith is not much of a subordinate. And on a tune such as “Wanton Eon” where he plays vibraphone, he is perfectly out front. But throughout, the two players are in a push-pull relationship, moving, dodging, working counterpoint that might turn to unison, and having a seeming conversation. “Dadaist Flu” is a good example of this collection’s energetic strength. Mitchell’s right hand states a theme, repeatedly, that surges and rushes with excitement, while the pianist’s left hand rumbles beneath in jagged harmony. Smith could have just set up a groove beneath it all, as the tune has a hip, lurching quality that actually seems funky. But, instead, he moves around the written melody, sometimes shadowing it, sometimes counter-posing it, sometimes set free of it only to come back to it again. But then the players ease into a quieter section, with the counterpoint still dynamic, but a sense of gentle silence starting to take up more of the improvised space. Smith gets quiet by rattling his sticks against the snare rim, then playing tight, rattlesnake snare rolls that push Mitchell out toward more exuberance again. It’s a joyful thing to hear. There is also some whimsy and some balladry here, even if those are not the primary tones of Fiction. “Id Balm” has a light, dancing theme, which Smith augments with bells as well as snare, setting up a sense of three-way dialogue. Mitchell lets his piano ring in harmonics at the high end, and there are sections where the two musicians almost seem to be chirping in the treetops together. “Diction” starts with a drunken, high melody for vibes and piano that comes down to earth in a lovely, lyrical way, leading to a cushiony section of playing that never gets lazy or too easy -- in fact it becomes a thrilling march just before returning to the theme. “Narcotic Bases” is a dreamy ballad that twinkles like stars above a thin cloud cover, Mitchell’s pedaling creating a rich soup of overtones that interact with Smith’s vibes. I also love “Nightmare Tesseract”, which begins as a free ballad, rich in harmonic chords that ring openly but then picks up momentum over time so that, by the midpoint, it is crashing all over, like a city coming apart at the seams. The chaos then stops on a dime. Whew! My only reservation about Fiction is that it presents Matt Mitchell’s pianistic talents narrowly, despite the disc’s relative range. Mitchell seems to have targeted this work very specifically, and maybe too many of the tunes have the same jagged, clattering, free vibe. I’ll admit that the song titles don’t mean anything to me. I’ve heard the disc 10 times but struggle somewhat to distinguish between many of these tunes. But this isn’t the kind of jazz record that sets up classic “compositions” that some other musician is likely to cover some day. It is more like a live concert experience, a journey that two musicians are taking together, one you watch from a small distance, dazzled. If you don’t focus on it, sure, it’s a whole bunch of clappety-smack-tap with less melody than you might be used to. But, as piano can teach us sometimes, melody ain’t the main thing in music.